NOTE: The golem@Home project has concluded. After accumulating several Million CPU hours on this project and reviewing many evolved creatures we have concluded that merely more CPU is not sufficient to evolve complexity: The evolutionary process appears to be hitting a complexity barrier that is not traversable using direct mutation-selection processes, due to the exponential nature of the problem. We are now developing new theories about additional mechanisms that are necessary for the synthetic evolution of complex life forms. Some of these new mechanisms are based on ideas of modularity, regularity, hierarchy, symbiosis and co-evolution. These ideas are resulting in a new generation of artificial-life systems. If you are interested in our developments, please follow our recent publications at Brandeis DEMO Lab and Cornell CAD Lab. We thank the more than 30,000 participants for their assistance, and hope it was an enlightening experience. You are still welcome to install and run the Golem@home client for your own curiosity. The Golem server will not be running, however you can exchange individuals with other clients by directly keying-in their IP-addresses in the communication property sheet, or by saving/loading individuals and sending them by email. The Golem@Home Project is a screensaver aimed at harnessing idle CPU power across the Internet to perform massively distributed evolutionary computation. By installing this software you are volunteering your computer to participate in this distributed AI experiment. While you participate, any creatures born (evolved) on your computer are copyrighted to you. At any point you may uninstall this program and thus discontinue your participation. 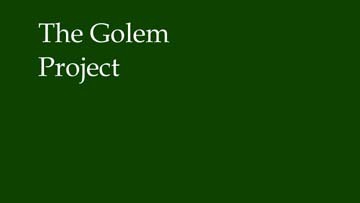 The Golem program is a screen saver. Once you complete the installation, click the right mouse button on your desktop to activate desktop properties dialog, and select "Golem" from the list under the Screen Saver tab. Thereafter, whenever Golem is activated it will continue evolving bodies and brains of electromechanical robots, and animate some on the screen. Occasionally (say, once in a week or two), if a network connection is available, one or few evolved creatures might migrate from your computer to another Golem screen saver that happens to be active on the net, and some new ones might migrate into your Golem program. For security considerations Golem will exchange only data with other programs, and will not receive or transmit executable files. Furthermore, for privacy considerations Golem will only transmit data associated with the Golem project. In any case, you may use the advanced settings communication tab to disable incoming communications or all communications entirely. This program does not need to connect to a server to run. It will work fine in an isolated environment. You can key-in IP addresses of other participants you know from the eGroups and allow your programs to echange material, or you can directly save and load Golem files, and exchange them by E-mail. From time to time, Golem will check if a version update is available. If so, a new version will be downloaded automatically directly from the DEMO Lab at Brandeis University. For security reasons, no other source will be used. Again, automatic version update can be disabled at the advanced settings communication tab. If you disable this option, please check this site from time to time to see if any major changes occur, or ask us to notify you by email. Creatures born on your computer are copyrighted to you according to the contact information you provide at installation or at the advanced settings identification tab. They will carry your ownership information during their entire life span, even when they leave your computer. If communication is enabled, this information will be accessible to others. You may change this information or enter false identification at any time. To minimize human intervention in this experiment, you have little control over the evolution of these creatures. They will evolve autonomously. At most, you may have indirect control by changing population size, wiping or reverting an entire population, or changing the landscape in which they evolve. You may try to use the control you have to make the creatures evolving on your computer better and more robust, so that they survive when they migrate to other machines. This is a form of human machine co-evolution. 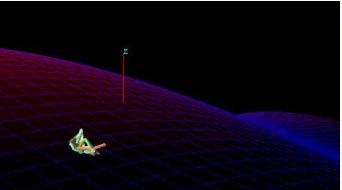 We reserve the right to publish any results and statistics obtained in this experiment. If you have any questions about this study or your rights, please contact us. To download the installation package for Golem 2.45, click here Win95/98/NT (740K). After download, unzip the file into a directory and click on "Setup.exe". After installation, right-click your desktop and select "Golem" as your active screensaver. If you are missing DLLs, and before e-mailing questions, please check out our frequently asked questions (faq) page. This project is in its initial phases. Join the Golem@Home mailing list for annoucments of new revisions, bug fixes and progress reports. The list will only be used for the Golem@Home project and will not be given to third parties. You may unsubscribe at any time. There is also an independent eGroup news group you can join. If you have access to a 3D printer and would like the STL file to print one of the robots for yourself, let us know. Similarly, if you have evolved a robot and would like us to generate an STL file for that robot, contact us. Note: To play DivX (Mpeg 4) videos, you must have MPEG4 codecs installed. Codecs for PC/Mac/Linux are available from DivX-Digest. (On NT or Linux, codecs must be installed from administrator/root accounts).